President Obama always quietly pointed out that Russia for the attention it gets is a weak economic country…. China on the other hand is closing in the American dominant world economy…. Donald Trump’s attempts to halt the Chinese in a trade war has been a failure right now as Chinese imports continue to climb to the US…. China has an opening in Europe…. The U.S. has responded furiously in recent days, suggesting that Italy is a traitor to the West. Europe’s largest countries, too, have expressed alarm. What worries China critics: Thus far in China’s four-decade economic surge, Beijing has largely called the shots. Its businesses have enjoyed a relative open door to western economies while it has constrained access to its own markets, and displayed little respect for Western intellectual property. 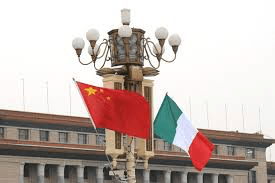 While President Trump, with his trade war, is attempting to break down some of the barriers, the Italian breach in Europe could weaken the solid western front…..